Debut children’s author Cheryl Malandrinos ponders the scenario in Little Shepherd. She allows her readers to witness firsthand the coming of the Messiah. She transports them to the stable in Bethlehem placing her readers in the very presence of the Holy Family on that silent night over 2,000 years ago. Such a story is sure to make an impact on the mind of a young reader in a way that few books can. The shepherds found under a child’s Christmas tree are brought to life. Their story and symbolism are significant, and not an afterthought. They are not merely figurines representing some ancient tale, but flesh and blood individuals who were alive to experience a truly miraculous event. Malandrinos’ touch is similar to the style of the classic Rankin/Bass animated TV specials from the 1960s and 1970s such as Rudolph the Red-Nosed Reindeer, The Little Drummer Boy, and The Year Without a Santa Claus. It is in league with the timeless, quality children’s entertainment that endures through generations. It is one of those books that has the ability to become deeply ingrained in a child’s memory as one of the traditions that they associate with the holiday itself. What is admirable about Malandrinos’ approach is that she doesn’t shy away from the holiday’s true religious foundation in order to appeal to children through talking snowmen and fun-loving elves. Instead, she brings the heart of the Nativity front and center capturing children’s attention by telling the story from the point-of-view of someone their age. 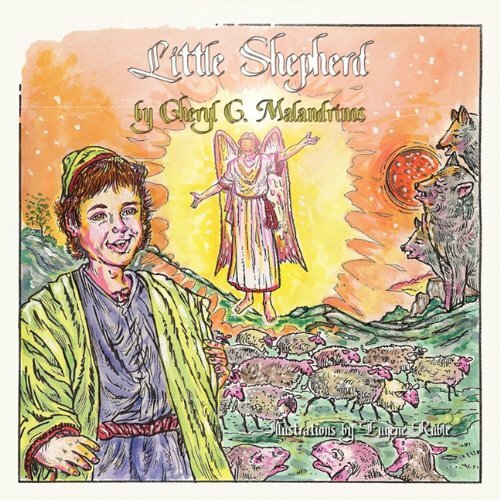 While the title character may have more responsibilities than a child of today, tending to an entire flock of sheep, Malandrinos balances the difference in time period by showing the child-like joy experienced by the adult shepherds at seeing the Messiah. They willingly leave their sheep—even with wolves nearby—in order to heed the angelic announcement of Jesus’ birth. He wonders what could be so important that they would do such a thing. Their reaction to the newborn intrigues him, and he yearns to discover what it all means. It is a beautiful lesson for young readers to experience. The most important thing in life is not one’s job, status, or material wealth; it is, suggest the book, God. Overall, the Little Shepherd will guide his flock of young readers to the true meaning of Christmas.